UPDATE!!!! 4 mintues – check it! 2. SAVE THE DATE FEB 15th! 4. Week 2 starts tomorrow!!! These 5 things… new week starts tomorrow – DON’T GO 1/2 WAY WITH THIS! Your single season journey is worth it, dig in!! 1 – Day 6, proverbs 6! 3. Check my “husband list” post on instagram >>> @single_space <<< or view the husband list video on fb here! 4. Community is EVERYTHING! There is POWER in the journey together! If you don’t have a community group or accountability partner, wherever you are, let me know! 5. Read it, speak it, write it, soak in it, post it EVERYWHERE – and pray it for yourself and your single sisters!! New verse coming soon!! If you know someone that might be interested or if you have recently joined us, please grab a pen and notebook and watch this! It’s about 20min long but gives the basic foundation to spring from! If you’re in, contact me! Previous Post FAB FRIDAY 5 IN 5!! I just wanted to say this is truly amazing. I just love everything you talked about. Living in this generation now it is super hard to have that outlook that being single is just a season, especially when the media has become so sexualized and its become so important in our culture to have someone. Whether that be in a relationship or even just friends with benefits. I am 19 yrs old and almost 20, I do have seasons in my life where I question why I dont seem to be in a relationship. Bu in those times i dig deeper and harder into God for I know He is holding my heart. Being said that I have never been in a relationship, cant say I have ever been on a date or experienced my first kiss, and its hard cause some of my friends do look down on me. Not only that but I chose to wear a purity ring and when my coworkers hear about they just smirk. But all in all my heart is in the same boat as you. I have such a heart for young single girls. I just want them to see the beauty they have and to grow in that before stepping foot into a relationship! For them to have wisdom when they go into relationships and friendships. Because it is easy to get caught up in the flattery and other things. And although the waiting may be tough, in the end it will be so worth it! I just wanted to say thanks for the follow on IG. I am definitely going to be challenging myself to dig into the Word more and asking God for wisdom when it comes to those Relationships! Stacey asked us to post our Wifey and Aint No Wifey Lists! SO here I am. Can I tell you that today I do not feel like a wife, or that I could really ever get there. Yes, one of my greater dreams is to be a wife and a mom and yet I find myself facing some real battles and real fears and crying out to God with the faint whisper I have left in me, to help me overcome. Ya, sure I get through the day and get er done, I can even pull off a cute outfit and sport around in a fun jeep, making a room full of people laugh, BUT there are days I am up to my neck in fear and struggle and I cant even put these struggles into words. The thought of being a wife and mom seem far off today. In the past and still today (although I am not in a relationship currently) I have been/I am SELFISH. 2) I hope my security won’t be in my appearance or a physical relationship but in Jesus alone. 3) I want to trust my husband BUT my TRUST will be in Jesus. 4) In dating OR in marriage I hope that I wont turn to the sexual for anything! In marriage it will be a beautiful gift and in dating we will be hoping and praying for purity until marriage. 5) When my husband hurts my feelings, I desire to turn to Jesus and seek His face. I want to forgive my husband and respond in love. Not REACT in the flesh. 6) I desire to be spending time with Jesus and getting in His presence, so HE can fill me up. Knowing my identity must be in Him. 8) I desire to be seeking Christ to help me cast my anxiety on Him and let go and not control or manipulate others. 9) I desire for healing and freedom from co-dependency, that I wont turn to people to fill me. I know I will be needy and when I am I trust God to bring the right friends or family members to speak truth. I also pray that my neediness will draw me closer to Jesus. 10) Oh Perfect LOVE, trusting for more perfect love that casts out fear. 11) Oh that my actions will match my words more! 13) FULL OF JOY, THAT MY COUNTENANCE will BE FULL OF JOY and THE JOY OF THE LORD WILL BE MY STRENGTH! generous,submissive,kind,funny,creative,takes care of the household well,excellent mother,helps the poor, sees the broken hearted even in their fancy clothes and pretty makeup, yes, sees past the appearance and knows when to be there for someone hurting, good cook, takes care of myself,hard worker, gentle,noble, industrious, strong in a godly strength, being a fortress for my husband,comfortable with my womanhood. These are my hopes, my prayers the things I would love for the Lord to fine tune in me and only Jesus can help me be more like Him! This is an easy list because I AM A DREAMER. I probably write this list out once a month! Now actually getting er done is the hard part. Mainly lack of money, intimidation and lack of discipline hold me back. BUT as a dreamer, I can’t stop trying to reach my dreams and so I do write them down a lot. IT IS ALWAYS fun to cross one off!!!! This past summer a dream was fulfilled and I spent 2 months on the ocean seeing friends I hadn’t seen and dreaming up new dreams. SO here is the list! AND something about the WIFEY list I just posted. IF I never were to get married I STILL HOPE I BECOME THAT WOMAN. Married or not, I want to become more like Christ in every way possible! My Name is Kala and I am 18 years old. I know that I am late but I am going to commit to doing the 40 day challenge. 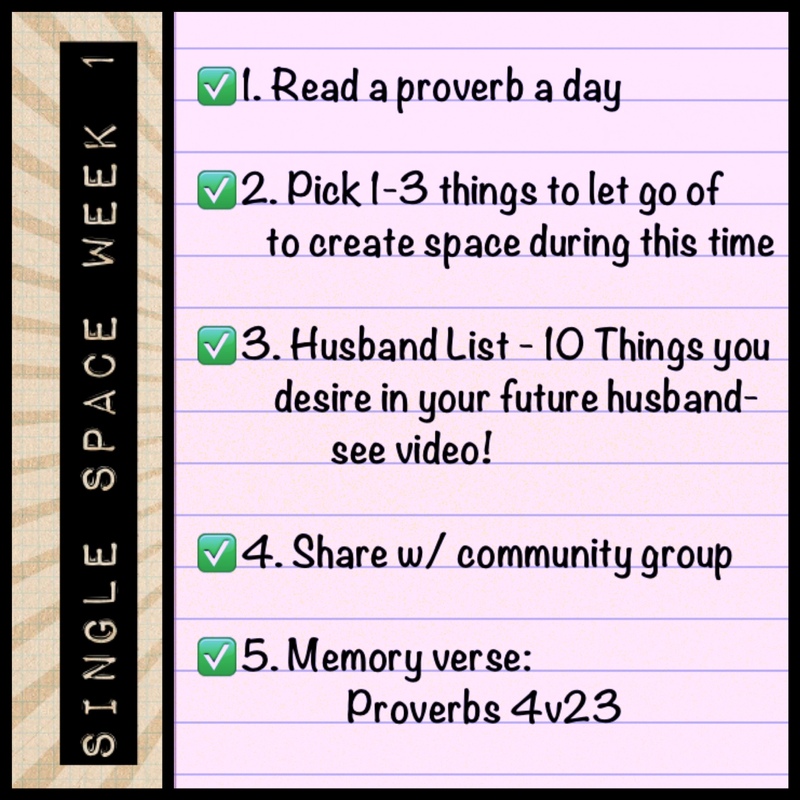 I am starting from week 1 so I am choosing 1 – 3 things to let go to clear space in my life for God, creating my future husband list, and starting my daily reading of proverbs. I just moved to Illinois so I have no community of spiritual sisters etc.